Here at RTA, we thank you for using our services, and so does the Earth! Did you know that transportation accounts for 29 percent of greenhouse gas emissions in the United States? The Management Development Program (MDP) began in 2008 as a way of building bench strength within RTA for future leaders. During the 2 year program, MDP's rotate throughout various departments while remaining focused on performance management-based projects. The end result of the program is a well-rounded employee geared for success at RTA. The program is now in its 5th class cycle, recruiting for the 6th class, and has produced many successful employees. On Thursday, March 28, 2019, members of the RTA K-9 unit met with a family at Transit Police Headquarters. This family includes a special boy named, Brady. He has an organization called Brady's K-9 Fund. Cleveland’s very own International Film Festival kicked off this week! Do you know how you’re getting there? Why not ride RTA, it’s the easy way! Taking RTA transit is the easiest and least stressful way to get to Tower City; just hop on the Red, Blue, or Green lines that all have direct routes to Tower City. RTA’s HealthLine runs 24/7 on Euclid Avenue and stops directly across from the JACK Casino, adjacent to Tower City. Several other bus routes run 24/7 as well. We would like to congratulate William Pillow, Alarice Reedy, and Calvin Scalf for receiving the 2018 General Manager’s Customer Service Award! Mr. William Pillow from our Hayden District has multiple nominations from many passengers that all stated he is consistently compassionate towards his riders. RTA passengers applaud Mr. Pillow for his kindness, professionalism, and positivity throughout their trips on RTA. They say he is always providing service to his passengers with a genuine smile! Today is Transit Driver Appreciation Day! We are honoring our hard-working operators, both bus and rail, for their dedicated work and tireless efforts to get the good people of Cuyahoga County to wherever they need to be. Are you attending Cleveland’s most popular event of the year? 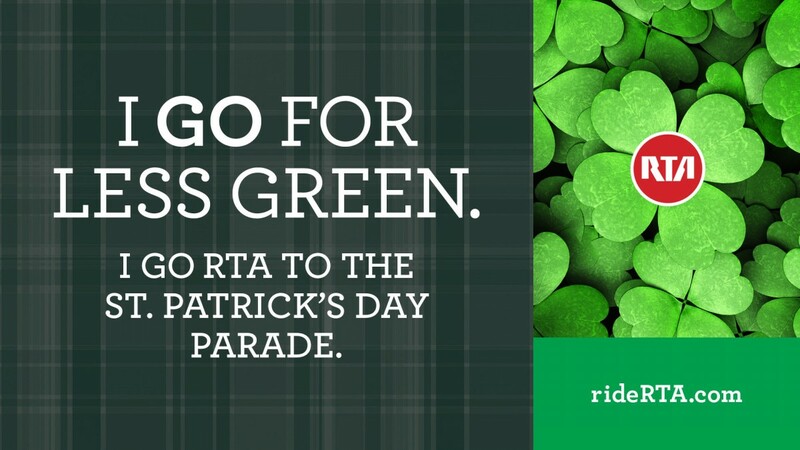 Why not trust RTA to get you to and from the parade! The first Cleveland St. Patrick’s Day parade is guessed to have begun in 1867! Fast forward to 1910 when State Sen. Dan Mooney introduced a bill that would make St. Patrick’s Day an official holiday in Ohio. The RTA Travel Trainers are a small but mighty duo; Adrienne Parker and Alisa Murray are the faces of the RTA Travel Training service. Both come from the social worker backgrounds and coincidentally, used to work together prior to RTA. Adrienne has been with RTA for 6 years now and Alisa has been with RTA for 4 years. In their time here, they have been able to touch many lives by giving people the skills to be able to conquer public transportation. Rob Atkinson is one of RTA’s finest Service Quality Inspectors and has been part of the RTA family for almost 18 years. Rob began as a driver at Harvard and then Triskett where he worked his way up to being an ambassador on the trolleys. Rob has a long line of family members who have worked for public transit, so he sure has a lot to live up to. He has family generations long before his time working for RTA and with his initials being “RTA”, you could say he was born into his career!